Do you suffer from Headaches and Jaw pain? TemporoMandibular Joint, better known as TMJ, is a small disc of cartilage which connects the lower jaw bone (the mandible) to the skull. Each person has two matching joints located at the front of each ear to allow the necessary mobility for chewing and swallowing food, making facial expressions and even speaking. The abbreviation TMJ literally refers to the joint but is also used to refer to any disorders or symptoms of this region. Such conditions include headache, earache, limitation of jaw movement, toothache, and other various types of facial pain. Many TMJ related conditions are a result of the daily physical and emotional stress on the structures surrounding the cartilage. These structures include muscles of the jaw, face, and neck to name a few. Daily stress can lead one to clench and grind teeth, both during the day and at night while you sleep. By clamping together tightly the top and bottom teeth, especially the back teeth, extra pressure is forced on the muscles, tissues, and other structures around the jaw region. Many people who clench their teeth also grind. Grinding, another cause of TMJ, is the sliding of teeth over each other, generally in a sideways or back and forth motion. In addition to daily stress, other possible causes of TMJ-related symptoms include arthritis, fractures, and dislocations. The National Institute of Dental and Craniofacial Research (NIDCR) of the National Institutes of Health (NIH) indicate that over 10 million people in the United States suffer from TMJ problems. Although experienced by both men and women, 90% of those seeking treatment are women in their childbearing years. Although there is no current evidence to prevent TMJ, many patients have sought relief in special mouth guards such as the NTI. Mouth guards have been used since the 1930's to prevent teeth grinding, clenching and TMJ disorders. Some have found that massaging various muscles helps to relieve tension of the muscles. Muscle relaxant medications may also help reduce inflammation in the jaw stemming from arthritis or other causes of inflammation. More aggressive treatments include orthodontic realignment of the teeth or surgical reconstruction of the jaw. The NTI device is a dental mouthpiece that a we provide our patients for the treatment of Migraine Headaches. 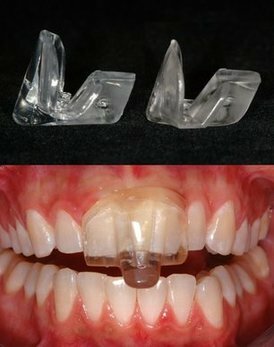 The NTI fits securely on either the patient's upper or lower front teeth while asleep. The unique presentation of the patient's bite dictates the design of the NTI device.